It’s called prickly heat in the sense that it’s itchy and is caused by the sweat stuck in the pores and spreads into surrounding tissue, irritating it. It’s not a disease, it’s only a discomfort and may go away on its own in 3 to 4 days but there are ways to speed its exit and finally relieve the itching. Alternative healers suggests the following remedies. For a minty itch relief, take a cool bath with peppermint added to the water. Wrap a cup or two of fresh peppermint leaves in the cheesecloth and immerse the mint in a tub of water for 3 to 5 minutes. You can soak in the minty water for 5 to 10 minutes to relieve the itching. This may be done as often as necessary. In Ayurvedic medicine, you can help cool the “pitta” or this fire element in the body using coriander and cumin seeds. Soak 1 teaspoon of cumin seeds and 1 teaspoon of coriander seeds in 12 ounces water overnight. Strain and drink the liquid the next day. This can be done daily until the rash goes away. A water based calendula gel may be used to rub on the affected area. It is advised that calendula ointment or cream be avoided as these will cut off the airflow into the rash, making it worse. Essential oils like lavender may also be used to normalize and regenerate the skin cells. It is very healing for any kind of skin problem including heat rash. 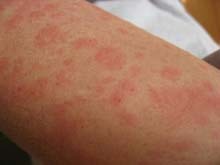 Remember, heat rashes are preventable. Specially now that summer is around the corner, always wear protective and cool clothing, hats and avoid too much perspiration. Enjoy the season but avoid the rash.